MeaningCloud LLC is a company based in New York City, specialized in software for semantic analysis, with nearly 20 years of experience in these technologies. Our mission is to make high-quality text analytics accessible to all types of businesses. Our product MeaningCloud is one of the leaders in the field of cloud-based text analytics. We are witnessing an explosion of unstructured data. Not only are more and more business models focusing on this type of content, but they need to exploit all types of data, from internal documents to feedback from customers or employees. Currently, organizations in all industries are immersed in a sea of unstructured data. The countless benefits of analyzing, understanding and exploiting such data include managing internal knowledge, preventing fraud, and understanding the market's perceptions and needs more effectively. Indeed, the availability of reliable and affordable technology to analyze unstructured content is a great catalyst for developing such applications. Our vision at MeaningCloud is to democratize access to these technologies, making them available in a flexible and accessible model through a fully scalable infrastructure. MeaningCloud is the most powerful, most affordable, and easiest way to extract meaning from all types of unstructured content, from conversations on social media to internal documents. Its pay-per-use APIs enable users to embed semantic analysis into any application risk-free; its plug-ins allow them perform text analytics from a spreadsheet and its text classification and sentiment analysis functions can be customized using graphical interfaces to adapt them to every domain, obtaining unbeatable accuracy. MeaningCloud is the result of a long-standing history in the fields of natural language processing and text analytics. Daedalus S.A. was founded in 1998 as a spin-off of two academic research groups from the Polytechnic University and the Autonomous University of Madrid (Spain) with the aim of providing advanced solutions in the areas of language technology, data mining, web technology and business intelligence. During its business development, Daedalus has provided solutions to first-rate customers in various industries such as media, telecommunications, government, and financial services and has participated in advanced international R&D projects, gaining a high reputation as an innovative company committed to its customers' success. As a result of its activity over the years, Daedalus developed its advanced technology in these mentioned areas, which has finally been gathered together in MeaningCloud, a product for text analytics. MeaningCloud was launched in February 2015 as the evolution of a previous product called Textalytics. A subsidiary was started in New York City (MeaningCloud LLC). In 2015, Daedalus became Singular Meaning, being invested by Sngular, a company with international presence and offices in the United States, Mexico, and Spain. 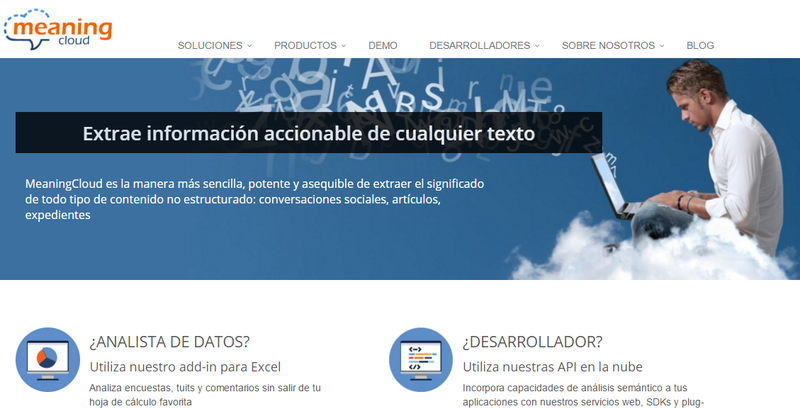 In 2017, the company was rebranded as MeaningCloud, with branches in Spain and the U.S.
At MeaningCloud we not only provide an advanced text analytics product, we can also adapt it and integrate it into your application scenario to obtain the best results. MeaningCloud, our semantic analysis API product, that is totally customizable and is available in both SaaS and on-premises modes. We provide professional services to customize MeaningCloud to your domain, integrate it into your corporate systems and develop new applications on top of it.